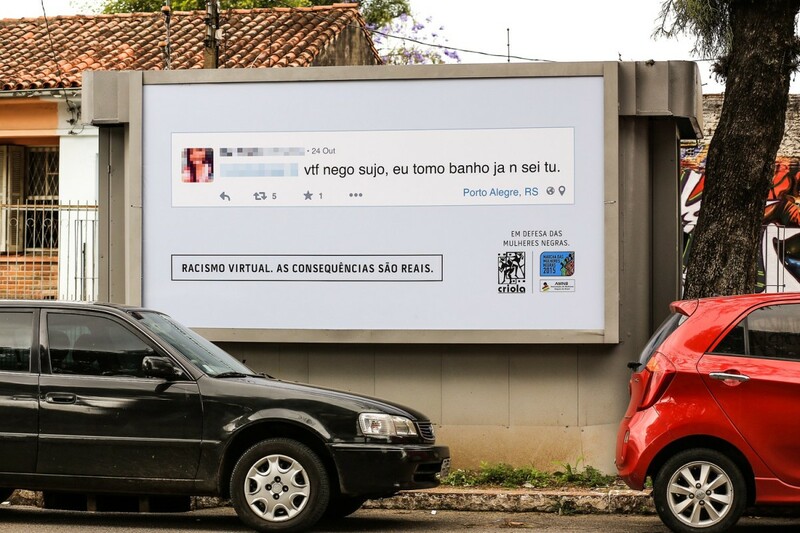 A group in Brazil has taken racist comments and turned them into billboards to raise awareness of the real-world impacts, reports Visual News. The campaign, “Virtual racism, real consequences” was created by advocacy group Criola to encourage people to speak out and report racism on social networks. The group collects comments from Facebook or Twitter and uses geolocation tools to find out where the people who have posted them live. They then buy billboard space nearby and post the comments, although names and photos are pixelated. “Those people [who post abuse online] think they can sit in the comfort of their homes and do whatever they want on the Internet. We don’t let that happen. They can’t hide from us, we will find them,” Criola founder Jurema Werneck tells the BBC. The campaign was connected to an incident where a popular black weather presenter became the target of racist remarks. The insults were targeted at Maria Julia Coutinho after her photo was posted on the Facebook page of Nacional Journal, a prime-time news programme. In a country where mixed-race or ‘pardo’ Brazilians, who may have a degree of black ancestry, make up a further 43 percent of the population, it’s an issue that continues to be hotly contested. On Facebook, commenters have come out both in favour and in opposition of the campaign that has been running since the summer. One commenter believed it was a waste of public funds – despite the campaign being privately funded – while another said racism towards whites was a greater problem. This week in Europe, an Action Day for Human Rights online will attempt to raise awareness of the issue to Millennials. According to statistics produced by Statista on the frequency of accidentally encountering material that promotes racist or extremist views online in the UK, the numbers appear to imply it’s not as big an issue as some would describe. The report however does not indicate how the respondents defined racism and so there is scope for bias in the answers. Sites such as Exposing Online Racists documents incidents on Twitter and Facebook indicate a fairly constant stream of Islamophobia, racism and pro-Life advocates online. But with this vigilantism there is always the looming spectre of what happens when the naming and shaming gets it wrong. Racists Getting Fired was another Tumblr site attempting to highlight racism online. But instead of naming and shaming they would actively encourage users to lobby companies to sack these employees. Brianna Rivera, a woman who appeared to have posted racially charged hate speech to her Facebook account caught the attention of Racists Getting Fired. However it would transpire that the account was a hoax created by an ex-boyfriend and deliberately submitted to the Tumblr with the sole aim of smearing her name. The implications for the anti-racist campaign in Brazil could have been catastrophic if they’d turned out to be wrong. As with all crusades, calls for caution can often come too late to save those it has affected.